The main goal of this module is to highlight and presents the arguments for doing a TEEB study. The Module finalized in 2013, is divided into four main sessions. 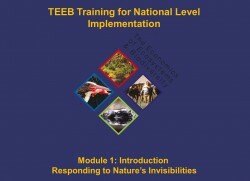 The idea and rationale behind this TEEB training resource material is to engage with national level implementers and demonstrate the value and importance of undertaking a TEEB study in their own countries. Being able to understand the importance and role of biodiversity and ecosystem services, particularly within national policy making, can ensure better decision making with regard to natural resource management and help address current policy drivers of biodiversity loss and ecosystem degradation. The training resource material has been developed by the UNEP TEEB office in collaboration with its various partners. The contents build on the 2012 TEEB reports and draw from the wealth of training materials developed under previous TEEB Phases, as well as under other relevant projects and initiatives e.g. GIZ training guide on how to integrate ecosystems services into development planning, SCDB online modular training course focusing on valuation and WBCSDs Business and Ecosystem Training. Session 1 Biodiversity loss and its drivers Reviews key terms and concepts around biodiversity, ecosystems and ecosystems services. Session 2 Biodiversity loss Identifies key drivers and causes for biodiversity loss and ecosystem degradation.